Do I really want to wear an alternative metal wedding band? Let’s begin by defining terms. Contemporary metals for the intent of this writing will refer to the alternative metal category. Alternative metals in general are those metals not included in the precious metal category (gold, silver, platinum). A few of the more prevalent examples of alternative metals are tungsten (also referred to as tungsten carbide), titanium, cobalt and stainless steel. This is the K109M (KOA wood inlay) - one of our most popular in the titanium line with a solid wood inlay. Titanium is a scratch-resistant metal in the contemporary metal collection and as you can see it has the capability of handcrafted details from artisans who truly know their trade. When compared to precious metal rings, alternative metal rings are priced considerably less. How much less? It depends upon many factors but a rule-of-thumb is that they will cost 50% of the price of precious metals. Can alternative metal rings cost thousands of dollars and have platinum inlays? Yes. Can an alternative metal ring be handcrafted with stunning, genuine diamonds reaching a full carat in weight? Yes. Can an alternative metal ring therefore costs much more than a traditional band in gold or silver or even platinum? Yes. But on average, the range in price of most contemporary metal bands is between $200.00-800.00 (this price range does not include the huge marketplace in “knockoff” alternative metal rings primarily in the tungsten carbide category that sell for under $30.00). M252HC with black diamonds and white tungsten carbide - one of the more popular of the alternative metal bands for men and women. People are often confused with a term quite prevalent in the fashion ring industry these days. The term is “comfort fit”. What does this mean? Comfort fit is a general term used in the industry to describe a process whereby the ring is beveled on the inside two edges of the ring so that the ring slips over the knuckle easier. This beveling effect has two very real benefits. First, the ring slips over the knuckle easier (more comfortable to slip on and off). Non-comfort fit rings can sometimes be very painful particularly if the ring has been sized ¼ to ½ too small. The second tangible benefit is that when the comfort fit ring is being worn there are no sharp edges built into the ring to pinch the finger. Thus, the term “comfort fit” was coined. We are seeing the major manufacturers creating more and more comfort fit varieties in the precious metal category but not as many as in the alternative group – in fact virtually ALL contemporary metal rings are produced these days in comfort fit. One last note to the person purchasing a comfort fit ring. Be careful when deciding upon the final size. The best way to make a determination as to your correct size is to visit your local jewelry store. They have sizing devices that take away some of the confusion. But remember, not all sizing devices have a “comfort fit” capability built into the device. Case in point, many people will wear a size 9.5 in a gold, non-comfort fit ring. But they will wear a size 9 in an alternative metal, comfort fit ring. The little extra material lost when beveling the inner edges of the ring allows many to reduce their ring by ½ size! If you have been shopping lately for jewelry – either in your favorite mall or online – you have probably been surprised by the vast array in style of what we are calling the alternative metal ring category. 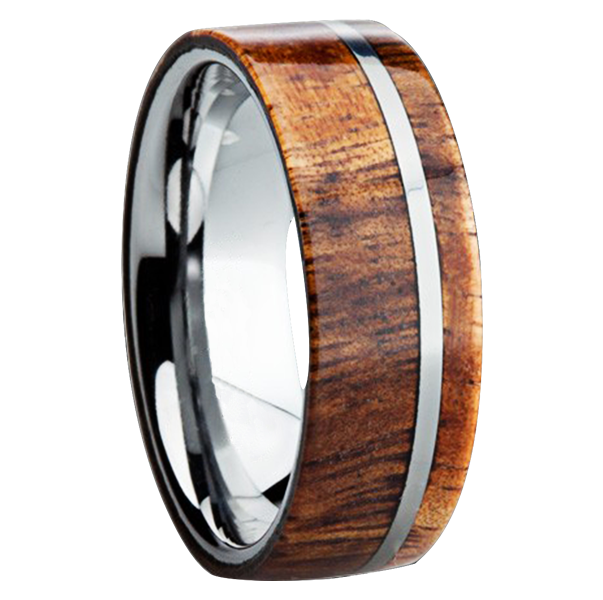 You will find exquisite tungsten or titanium rings with shell inlay, white gold inlay, platinum inlay, diamond medleys, and even exotic woods. You will also find cobalt rings that have been etched or laser-engraved in patterns never before seen. And of course in the steel category you will find the same inlays and engravings at a much more reasonable price point! If you have found a precious metal ring that is so stunning, so different, so unique, so YOU … chances are this same ring is available in an alternative metal. For the past decade artisans have been closing the gap between precious metal and contemporary metal designs – today there is very little (if any) daylight between these two broad categories of fashion ring jewelry design. So if you have been holding out thinking that to find something so unique and so dazzling that you have to stay with precious metals – those days are gone! 4. WHICH contemporary metal is for me? We’ll look at the pros and cons of 4 major material groups with the contemporary or alternative metal category. Tungsten. Titanium. Cobalt. Stainless Steel. Tungsten. Tungsten (also referred to as tungsten carbide) is by far the most popular of all the alternative metal rings in the world. By far. Why? The main two reasons are that it keeps its sheen and luster longer than any other metal ring on the plant. It simply does not fade or dull over time with only a few exceptions (a person must be careful with some of the “knockoff” rings that through vastly inferior manufacturing processes tend to fade and discolor and oxidize over time). The reason is that tungsten is extremely hard making it very scratch-resistant. Not scratch-proof. Scratch-resistant. There is a big difference and people need to understand that ALL rings will scratch at some point or at some time in the life of the ring. This is to be expected. 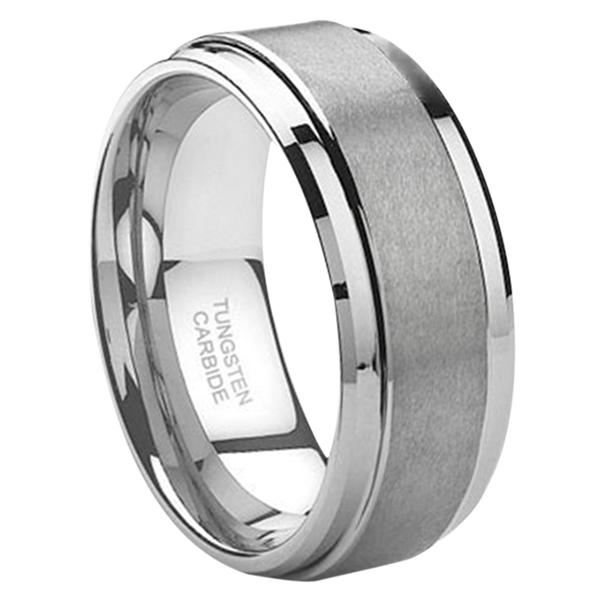 But, if you are looking for a scratch-resistant material in a men’s or women’s ring – it is tungsten leading the way. Now the downside – because it is so hard, so scratch-resistant, it is brittle. If you drop the ring onto a tile or even hardwood floor, it might break into pieces. That is the nature of tungsten. Does it happen often? No. But one should beware that even with this popular metal category there are risks. If you are wanting a ring that is heavy to the feel with a sheen that is virtually permanent – this is the ring for you. Below you will find one of our more popular "classic-cut" tungsten bands with a brushed center and highly polished step-edges. This one comes with a lifetime warranty against even scratches! 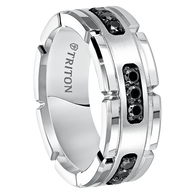 For the budget-minded this ring starts at under $200.00 and comes in black as well as silver/gray tungsten. J095C with classic cut in silver/gray tungsten. Titanium. This superior metal category is also harder than gold but not as hard as tungsten. Titanium is a rich gray in color but there are a number of manufacturers now producing black titanium which has become extremely popular. This metal has the highest weight to strength of any metal known which makes it light weight but extremely durable. Another nice feature is that it is an easy metal to craft meaning that stunning designs can be created in titanium because of its malleable feature. Most titanium rings are priced above stainless steel but below tungsten and the greatest drawback is that although a hard metal – it is far more likely to be scratched than a similar ring made from tungsten. If you want a more lightweight ring with dazzling features – one that is virtually seen but not felt when being worn – then titanium is your choice! Cobalt. Cobalt looks expensive because it has the white, shiny appearance of a white gold or platinum ring. And unlike platinum there is no rhodium plating to wear off on a cobalt ring! Although some cobalt rings, given their nickel alloy partner, have tended to cause skin irritations in the past, the more recent models are hypoallergenic. Cobalt – although it has the appearance of platinum – is approximately seven times harder making it another in the fine line of scratch-resistant contemporary metal rings. If you desire the look of platinum without the price – you might consider a cobalt wedding ring! Stainless Steel. Stainless Steel is affordable. It is the perfect alternative metal ring for someone on a pretty serious budget. Can you buy really expensive stainless steel rings with diamond and gold inlays – yes but they are far less accessible than the same style in tungsten and the other contemporary metals. Stainless Steel is created in intense-heat ovens (typically for 10-12 hours) and is referred to as 316L once it is used for the fashion ring industry. Another characteristic of stainless steel is that 10.5% of the finished product is comprised of chromium alloy. For those who have worn stainless, the one drawback is that it can be bent and is more scratch-prone than the other alternative metals. If you are on a budget but want style and can be careful when wearing your ring – then you may have just found the ring you want in stainless steel! It is the opinion of the author that alternative metal wedding bands not only offer a stunning and compelling “alternative” to the precious metal category but that when researched and studied carefully by the intended wearer of the band, purchasing a contemporary metal ring can be a life-long choice made without regrets. Unless one desires the assurance that the wedding band they have chosen is of a “precious” nature, there are no visible or hidden undesirable consequences when an alternative metal wedding ring has been selected. Based in St. George, Utah, Tayloright LLC, began operations in March of 2009 selling wedding rings, men’s jewelry and rock climbing holds. Currently, Tayloright LLC serves the international wedding band marketplace shipping to countries worldwide. Their innovative products and accessories offer a fashion category that allows both men and women to enjoy eye-catching, stunning designs in alternative as well as precious metals. The Company carries products that are backed by their lifetime defect and sizing warranty. Average wedding band prices from their combined websites range between $300.00-400.00 although they also carry precious metal rings that sell into the thousands of dollars. Its premier website is www.mensweddingbands.com.